The United States is awash in water data—the power of which has yet to be unleashed. To realize the dormant value of the data, say some producers and users, would require making them widely shareable in standardized digital formats, thereby allowing their real-time aggregation for a host of purposes beyond those that spurred their original collection. They believe that opening the data and investing in water data infrastructure would set in motion a wave of innovation, leading to more sustainable management of our water resources. They envision creation of an Internet of Water. That project is the brainchild of representatives from government agencies, non-governmental organizations, agriculture, utilities, energy firms, technology firms, and software development firms working together through the auspices of the Aspen Institute Dialogue Series on Sharing and Integrating Water Data for Sustainability. Duke University’s Nicholas Institute for Environmental Policy Solutions and the Aspen Institute partnered with the Redstone Strategy Group to convene the series in 2016 and 2017. The goal: to formulate a national digital water data and information policy framework for sharing, integrating, and disseminating public data to characterize and forecast the quantity, quality, and uses of water across the United States. In the United States, water management is hindered by decision makers’ inability to answer three fundamental questions about our water systems in a timely way: How much water is there? What is its quality? How is it used (withdrawn, consumed or returned for different purposes)? Put another way, existing state, regional, and national data collection efforts focus on portions of the water cycle or a specific geographic region—not whole water systems—and coordination of those efforts is stymied by institutional barriers and norms that discourage data sharing. Doyle and Patterson liken the emerging value of water data to that of transportation data. Integrating federal road data with state and local road data and pairing the resulting public road dataset with GPS, another public dataset, has made possible the development of private applications such as Google Maps and Waze that we use every day. The public data provides a context within which to incorporate non-governmental data and crowd-sourcing tools. Sharing and integrating water data could similarly revolutionize how we manage water resources. 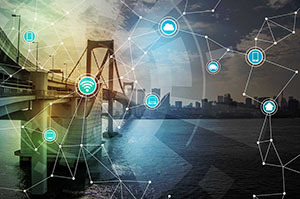 The dialogue series convened by the Nicholas Institute, the Aspen Institute, and Redstone culminated with three overarching findings that informed the proposed Internet of Water. First, water is undervalued—and water data even more so. Moving water from its source, treating it, and delivering it to faucets has a cost. Similarly, collecting data, “cleaning” or standardizing them, and delivering them to an end user has a cost. But unlike water utilities, most public agencies know neither the full cost of their data infrastructure nor the water and cost savings of putting the data to timely use. This blind spot has discouraged public agencies from further investing in data infrastructure. “If the benefits of sharing water data in terms of meeting an agency’s mission and providing a good return on investment aren’t articulated for public agencies and organizations, they won’t direct already-allocated funds to making the data available,” said Patterson. Second, there’s a need to make existing public water data more accessible. The data’s value in decision making is diminished if the data are hard to share across platforms. Thus, it is critically important that data, particularly at the local and state level, become more discoverable and usable. The problem is that many state and local governments lack the resources to invest in data infrastructure. Third, the appropriate architecture for an Internet of Water is a federation of data producers, hubs, and users—entities often isolated from one another. Initially, some overarching governance structure is needed to intentionally connect data hubs and to help coordinate adoption of shared metadata and data standards to ensure that data hubs can talk to one another. Within the proposed framework, data relevant to sustainable water management would be shared by communities with specific roles and responsibilities. Data producers—from irrigation districts, to federal agencies, to industrial water users—would collect data according to their needs. Data hubs—data-sharing communities—would ensure data integrity is maintained. An umbrella governance structure would connect data hubs to one another as well as to data producers and users. The resulting network would increase access to the data needed to create water budgets and thus improve water management. Dialogue participants think a functioning Internet of Water could be created over the next few years if a compelling case can be made for investing in water data and integration. One way to illustrate the need is to highlight regional projects that use shared and integrated water data to solve near-term water management problems for key stakeholders. In California, at least two projects have already done that. In the midst of the state’s historic drought, the California Water Board created a water conservation portal to give the public and media access to information on how more than 400 water systems, representing 90 percent of the state’s population, were doing in efforts to meet Governor Jerry Brown’s call for a 25 percent reduction in water use. Public awareness of the severity of the drought is thought to have changed behaviors, contributing to a 24 percent reduction in statewide water use during the worst 12 months of the drought. The board is now using water data collection and aggregation in a public health notification effort whereby an interactive online map tracks coastal water algae blooms potentially hazardous to humans and animals. Public awareness of that danger is said to have risen considerably since the effort began. For Steven Moore, vice chair of the California Environmental Protection Agency’s State Water Resources Control Board (State Water Board), these projects clearly show the benefits of the kind of modern data management that could be made scalable by an Internet of Water. “Easy-to-understand and easily accessible information about water resources can increase trust in water policy and spending and can encourage participation in conservation and public safety measures,” said Moore, noting that reliable data, structured in a way that makes sense to members of the public as well as to water experts, would increase public confidence in water management efforts made increasingly critical by the impacts of climate change, population growth, and fluctuating water storage. “With finite water resources and growing demand for them, we need open and accessible data to help us navigate tradeoffs,” said Greg Gearheart, deputy director of the State Water Board’s Office of Information Management and Analysis at the State Water Board. States are the logical candidates, Patterson said, to start opening up data. In turn, those data hubs will need resourcing to expand their mission and interconnections. Finally, a national governance organization must be created to structure and enable a system of federated data. Dialogue participants think that organization should be a non-profit that has a cooperative agreement with a non-regulatory federal agency. The dialogue series has set the Internet of Water in motion. For starters, says David Monsma, executive director of the Aspen Institute's Energy and Environment Program, the series has introduced two data hubs—the Water Data Exchange Program (WaDE) at the Western States Water Council and the Consortium of Universities for the Advancement of Hydrologic Science, Inc. (CUAHSI)—that had been unaware of the other’s existence. Now WADE is figuring out how it can share its water use data and CUAHSI, its water quantity and quality data for new uses. Work on this project is supported by the S.D. Bechtel, Jr. Foundation, the Kingfisher Foundation, the Walton Family Foundation, and the Pisces Foundation.